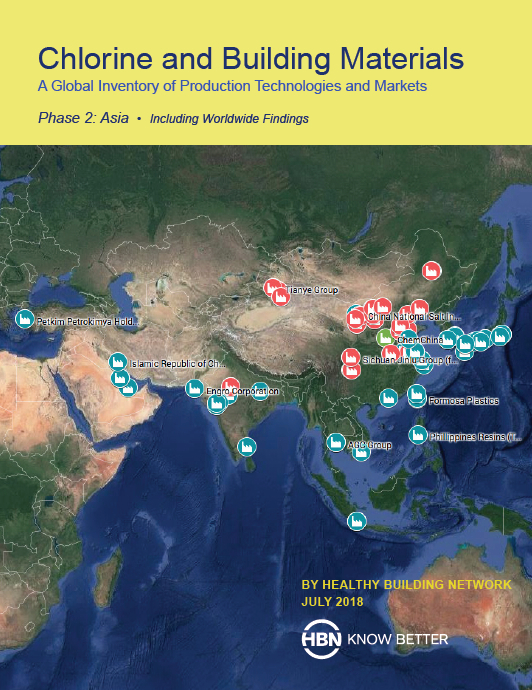 Many of the chlorine-based materials used in the building industry (such as PVC, polyurethane, and epoxy) come from Asia, making HBN’s report an important resource for learning more about their environmental impacts. Chlorine is one of the most common industrial chemicals and is one of the key ingredients used to manufacture PVC, polyurethane, epoxies, and other plastics. But chlorine is extremely reactive and readily forms persistent, bioaccumulative toxic chemicals (PBTs) in the environment, making materials such as PVC—which is approximately 57% chlorine by weight—pariahs in the green building community (see The PVC Debate: A Fresh Look). Chlorine production and consumption via PVC is rising rapidly in Asia, due primarily to China’s urbanization. Approximately 94% of Asia’s chlor-alkali facilities (which produce chlorine and sodium hydroxide) use more modern technologies that incorporate per- and polyfluoroalkyl membranes/coatings rather than older asbestos or mercury cell technologies. Approximately 83% of the vinyl chloride monomer (the building block of PVC) produced in China uses an acetylene process that consumes coal and a mercury catalyst. Approximately 85% of the PVC floor, wall, and ceiling coverings entering the United States in 2017 came from China. BuildingGreen noted back in 2014 that China’s acetylene VCM process is the world’s largest consumer of mercury. This, combined with the use of coal—the most polluting fossil fuel with the highest carbon output—as fuel and feedstock makes China’s PVC the least environmentally responsible PVC available. HBN’s phase two report explains how PVC products made using this process are being imported into the U.S. It also provides a factory-by-factory assessment of Asia’s chlorine and PVC supply chain, giving manufacturers and building professionals further guidance on the environmental impacts of chlorinated plastics.